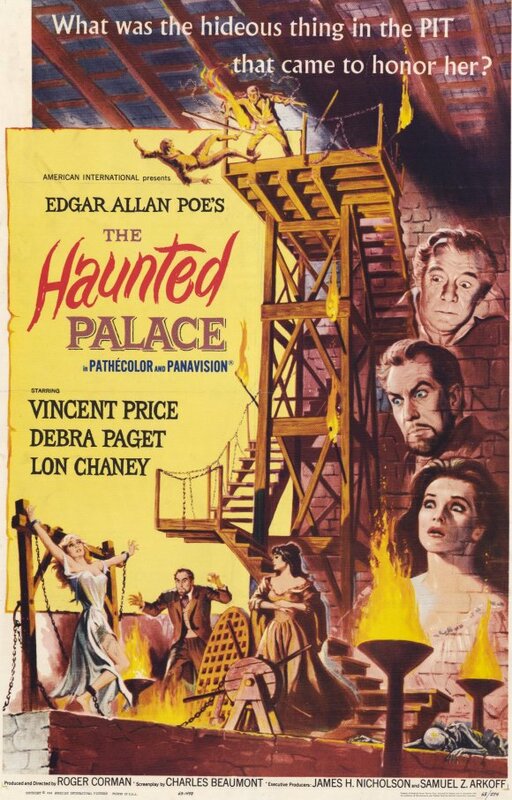 Cinema Sunday: The Haunted Palace (1963) | Magazines and Monsters! Once again, I’m strolling down the halls of the horror hall of fame! Not only does this film have Vincent Price, Lon Chaney Jr., but it also has Roger Corman directing! This is the first American film to introduce the works of H.P. Lovecraft to moviegoers. The film is based on a story called “The Case of Charles Dexter Ward” and not off of an Edgar Allan Poe story (a common misconception because of the way the movie was promoted as being part of the set of movies Corman had previously done). For fans of the film that don’t know about the story behind it, definitely read up on Lovecraft, he was an interesting writer. Alright, well, you can see from the movie poster, that this film is a wild one that involves all sorts of creepy elements. Murder, black magic, and beautiful ladies are what classic horror movies are made of…or so I’m told. AIP (American International Pictures) and Roger Corman made a lot of films together with this formula (8-9 I believe), and it worked out brilliantly. Price, along with people like Karloff, Lorre, and so on, had so much talent and an eeriness about them that vault these films from flimsy to fantastic! Now, without any further delay, here’s the film! The movie opens with a few men hanging out at a local pub (around 1765, somewhere in New England). One of them, Ezra Weeden (Leo Gordon – image above), sits by the window, as if he’s on watch. Another man, Micah Smith (Elisha Cook Jr. – image above) urges him to chill out and have some fun, but he refuses, citing that there’s foul play about, and he knows who’s behind it. Suddenly, amidst the fog, we see a young woman walking alone. Through the town, and up to the old house at the end of the town. The door opens, and she’s met by two people. Joseph Curwen (Vincent Price), and Hester Tillinghast (Cathie Merchant), welcome her in, and then proceed to take her to the bowels of the old palace. Once there, they chain her up over a pit, and after reciting some kind of incantation, a hellish creature begins to rise from the fiery pit. Meanwhile, the villagers have grabbed their pitchforks and torches, and are heading to the house. They hear her scream and begin to pound on the door. Curwen answers, and tells them to get lost. They question the girl, and she seems to be in a trance, so they agree that he’s a warlock, and drag him off to be burned at the stake. They initially grab the woman as well, but Curwen tells them to leave her alone because she’s been “hexed.” After they drag Curwen away, he tells Hester that once he’s dead, they’ll be able to be together again. They all march towards town, and then condemn him, and he warns them that he’ll return to seek revenge against the town leaders. They light the straw, and burn him anyway. Sherman set the WABAC machine 110 years into the future in New England. We see a man, Charles Dexter Ward (Vincent Price), and his wife, Anne (Debra Paget), arrive at the docks, and head into the town of Arkham. They are very excited to see a house that Charles has inherited, but cannot find it initially. They stop at a local pub, and ask the inhabitants of the home’s whereabouts. The townspeople are very frigid toward them, and even refuse to tell the location of the house. Ward and his wife are about to give up, when one of the men, Dr. Willet (Frank Maxwell), tells them how to get to the house. As they leave the pub, they run into some people with terrible deformities, and they wonder why so many in the town have this affliction. Back at the pub, the descendants of the original townspeople argue over the curse that Curwen laid on them, and the fact that Ward is a dead-ringer for him. As Charles and Anne near the home, they get an uneasy feeling, but enter once they arrive. 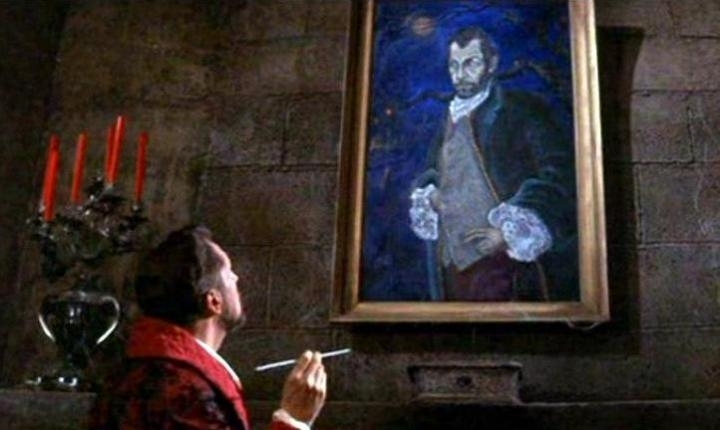 Ward then sees a painting of the previous owner, his great-grandfather, Curwen, and is struck into a momentary trance. Anne asks what’s wrong, and he tells her nothing. Anne attempts to open a cabinet, but then a poisonous snake pops out. Ward grabs a hatchet and chops its head off. Anne then moves towards another room, but Charles tells her that it doesn’t lead anywhere. She asks how he knows this, and he replies that “it’s just a guess.” As they search through the dark house, they’re surprised by a man, Simon Orne (Lon Chaney Jr.). He tells them that he’s the caretaker of the old palace, and that he has been so for a long time. Anne is frightened out her skin, but Charles seems to be OK with the creepy old guy. She wants to leave, but Charles insists that they stay the night. Over on the other side of town, we see one of the villagers, Edgar Weeden, and his wife. Edgar feeds a beast/person, that’s locked up behind a huge door. The thing grabs Weeden, and almost tears his arm off, but he uses the flame of the candle he’s carrying to burn it. Weeden then tells his wife that the beast knows who’s come back to Arkham, and that is why the beast is upset. Back at the palace, Charles has a cigar, and stares at the painting of Curwen. It seems to be driving him mad, but then he suddenly turns around, and has a sinister look on his face. The next day, Anne is ready to leave and asks Charles if he’s ready to leave. He tells her he’s decided to stay, so he can fix up the place and sell it. His demeanor is completely different, and he suggests that if she doesn’t want to stay, she can go home without him. She’s shocked by his abrupt attitude, but he then apologizes. That night, they head into town, but everyone seems to be gone, and the pub is closed. As they turn around, they’re surrounded by the deformed people in the town. As the church bells ring, they walk simply away. The two have Dr. Willet over, and have dinner with him. He explains to them why the other townspeople don’t like them, and all about the warlock, Joseph Curwen. He tells them that Curwen’s wife, died in labor, so Curwen selected Weeden’s betrothed for his new “woman.” He tells them that young woman began to disappear and Curwen was suspected. They then learned the rest of the gory details, including the curse. He also mentions that Curwen was rumored to have gained possession of a book called the Necronomicon (there’s your Lovecraft reference), and that it supposedly could give a man ultimate power, by being able to summon the Old Ones (Cthulhu, Yog-Sothoth, etc.). Later that night, Anne wakes up, and finds Charles out on the balcony, in the middle of a storm. He hears wailing from the town below, and it seems to intrigue him. As he walks downstairs, some unseen force leads him outside, and he begins to hear the events of the night his ancestor was burned. He’s surprised by Simon, and he tells Charles to ask Curwen about the voices he heard. 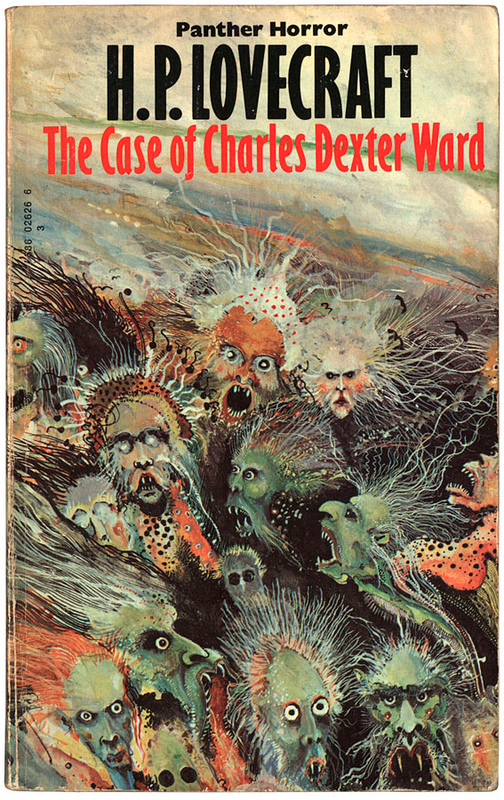 Simon then follows him inside the house, and Curwen then possess the body of Charles Dexter Ward. Simon then brings him the Necronomicon, and another servant pops up as well. Curwen then tells them that Ward is fighting him, and that he wont be able to gain full control for a while yet. Anne finds him downstairs but he cannot explain how he got there or why he cannot leave. The next evening, the villagers are discussing what they might have to do, but Dr. Willet tells them to stop being foolish. Ward/Curwen then has his two henchmen dig up a corpse, and bring it back to the palace. Anne asks what’s going on, and he tells her to mind her own business. Ward then tries to fight Curwen’s influence, and he catches Anne spying on him. He shouts at her and tells her that tomorrow she must leave for Boston. Upstairs in the bedroom, Anne hears some wailing, so she gets up to investigate the noise. A door creaks open, and she heads inside. Down to the lower depths of the old palace she descends, rats pop up, and then she finds an old wooden door, and opens it. As she’s creeping around, she’s surprised by Simon, and faints. We then see that Curwen exhumed his dead wife, and uses a spell to resurrect her, but it seems that she might be dead for too long and the spell wont work. Simon rushes him upstairs, as Charles is trying to take control. Anne explains to a bewildered Charles that he hasn’t been himself, and he agrees to leave the next day. Will Charles Dexter Ward be able to re-assume control of his body, or will the soul of his evil relative keep control and get his revenge against the villagers?!? Watch this one to find the answers! As a mild fan of the Lovecraft mythos, I can’t claim to know much about the film’s influence from the story (I’ve never read it). I will say this though, that even if the influence isn’t exceptionally strong,it still will intrigue you (and it has me) to seek out Lovecraft’s work. Corman did his usual magic with virtually no money, and it’s his forte. He’s literally the only director I can think of that time and time again made solid films with very little money. Sure, some of them weren’t so great, but the majority of them have very solid scripts and/or acting. Speaking of acting, Vincent Price delivers a performance for the ages in this one. I liken it to House of Wax or The Last Man on Earth. It’s that good. Debra Paget is great as the frightened wife, and really puts on a great performance. Her hatred for Curwen but love for Ward is incredible. Chaney isn’t in very many scenes, but adds his usual luster and presence to the film. The sets are small but effective, and of course, the budget had a lot to do with that. There wasn’t anything overly exceptional about the music score, but it was sufficient to get you riled up a time or two. Solid acting, sets, and a story that is eerie, creepy, and all around evil! Get this one on the watch list sooner than later, because you’ll enjoy it if you’re a Price fan, Lovecraft fan, or just a classic horror fan in general! I’ll have to give this one a watch again at some point. Great write-up! The Corman/Price gothic collaborations, when viewed as a whole, sort of feel like the same movie over and over again, kind of how summer-camp slasher films of the early 80s do. That said, Haunted Palace is one of the better ones in my opinion. For once, Price doesn’t start out as an obsessive recluse who is half crazy from the first frame. He gets more of an arc in this film, and there’s some nice moody imagery in the village that we seldom saw in the other Corman/Price films that followed the formula. I prefer this movie over the Poe-inspired entries, although they are all enjoyable. This one definitely exceeds the other films in my opinion as well. Just a totally different vibe, and Price seemed to be more able to do his own thing, rather than follow along with a script that tried to hard to mirror the Poe stories in the other films w/Corman. Thanks for stopping by, guys!